A battery is an electro-chemical device designed to harvest electrons. 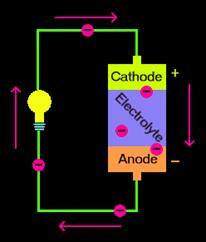 A battery works by taking advantage of the processes of oxidation and reduction, which together are termed ‘redox’. Creating a redox process requires that two substances come in physical contact with each other, and that one of them is an electrolyte. A classic example of this is a metal and a liquid, e.g., iron and salt water where oxidation takes place. In this example salt water is the electrolyte because it contains positively charged sodium ions (cations) and negatively charged chloride ions (anions). Oxidation takes place as the salt water strips electrons from the iron atoms. Because of the two redox processes, a battery has two cells, one called the anode, where oxidation takes place and the other called the cathode, where reduction takes place. Today there are many systems to accomplish the redox processes for batteries, but to illustrate the general principal a description of the galvanic cell is provided below. In basic terms from the illustration above, copper and zinc electrodes are each placed in their own sulfate solutions, which act as electrolytes. The zinc is oxidized by its sulfate solution where it loses electrons and creates positively charged zinc ions (cations). The freed electrons flow through the wire as an electrical current from the zinc anode to the copper cathode, which absorbs the electrons and creates negatively charged copper ions (anions) as it gets reduced by its sulfate solution. For the electrons to continue flowing from the anode to the cathode, the extra anions and cations also need to flow from one side to the other in order to maintain the systems charge neutrality. This is accomplished with a salt bridge, which allows for the passage of ions (anions and cations), but not for the passage of electrons. 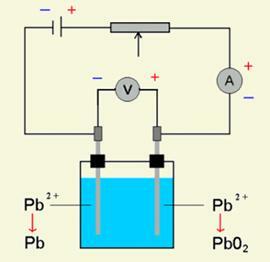 Here, the positive cations flow from the anode to the cathode and the negative anions flow from the cathode to the anode. 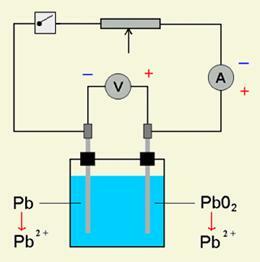 Without a salt bridge, the electrons would stop flowing through the wire from the anode to the cathode. As this process continues, zinc atoms are continuously disappearing from the zinc electrode and copper atoms are continuously being created around the copper electrode. The process ends when there is no more zinc left. A battery system that eventually dies out without the ability to be recharged, as in the galvanic cell, is classed as a primary electrochemical cell. Battery systems that can be recharged, and therefore repeatedly reused, are classified as secondary electrochemical cells. A classic example of a secondary cell is the common 12 volt lead-acid battery used in cars. The lead-acid battery works where the anode is made with lead (Pb) and the cathode is made with lead oxide (PbO2) and both are in an electrolyte of sulfuric acid (H2SO4). The chemistry is such that as the battery releases electricity both electrodes become lead sulfate (PbSO4) and the sulfuric acid becomes water. The advantage of this system is that the process is completely reversible and when an electric charge is fed into the battery the sulfate returns to the water and the electrodes return to their different lead states.